After six months and 11,082 miles, our time with the A3 is now over. And we’re in mixed spirits about that. While it has been an extremely desirable upmarket machine – especially in stand-out Tango Red paint and with big 19-inch wheels – with a stylish, user-friendly interior, it’s not as comfortable or sharp to drive as we hoped. It also chugged through more fuel than we’d have liked and never provided enough speed to compensate. Meanwhile, for the price of our car with options, you could have the much faster, more stylish and simply more satisfying Audi S3 Saloon. And you could get many thousands of pounds change – or save around £80 per month by going for the two-wheel drive A3 Saloon 1.5 TFSI S Line S tronic. So where would our money go? We loved our A3’s looks ever since collecting it from Audi and that hasn’t changed. It looks classy, modern and bold in retina-searing red with the oversized optional alloy wheels – and regularly received admiring glances from other motorists. That positive impression continued into the cabin, which felt high quality and well designed. 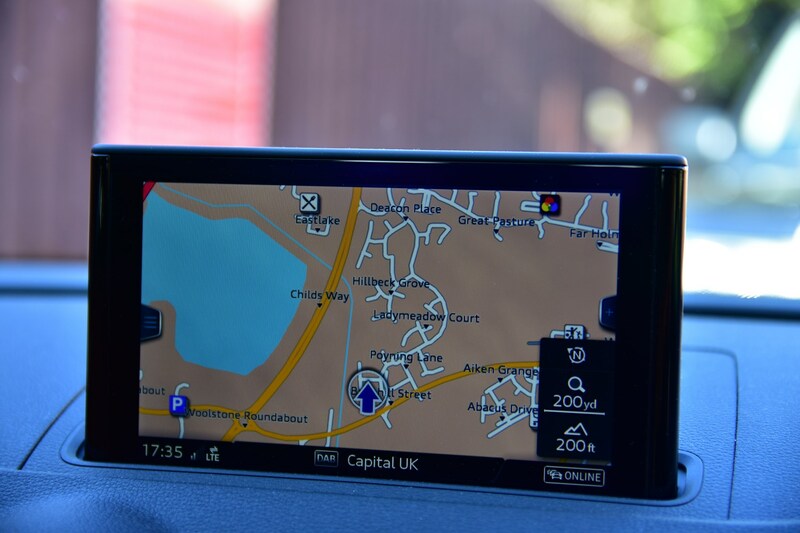 The upgraded sat-nav may have been part of a £1,395 option pack, but it worked very well, being easy to use on the move, providing clear spoken and visual directions. 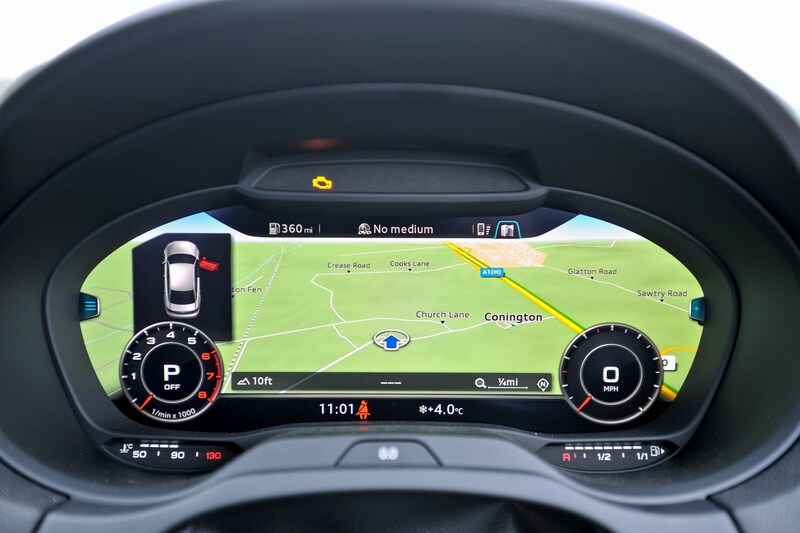 Adding to the high-tech feel, the – optional – digital dials can provide a large map where the speedometer would normally be, with scope to prominently display audio or phone controls, too. These might sound like small elements, but together they make the A3 effortless to drive over long distances. 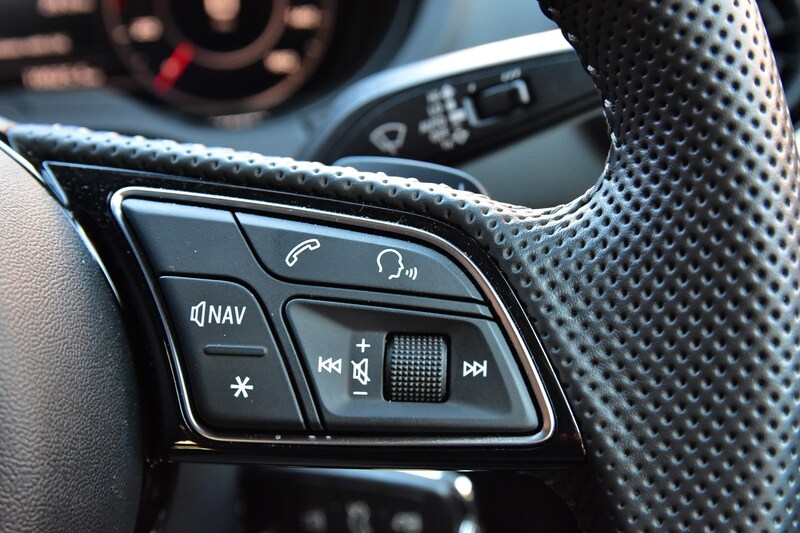 More importantly, they make changing settings much less distracting than it can be in models that force you to use a touchscreen media system to control these functions. Another element that makes the A3 relaxing to drive is the super-intuitive S tronic automatic gearbox. However fast or slow you’re driving, it seems to tune into the gear you want. While the 2.0-litre petrol engine isn’t the most powerful, it pairs well with the gearbox, providing strong pull from low engine speeds. Though we couldn’t justify spending a hefty £1,470 on the all-wheel drive system fitted to our car, it provides complete traction, with no wheelspin regardless of how hard you drive or how wet the road. Even though we’ve been running it for six months, we’re still affronted by just how costly the A3 is – whether you plan to pay with cash or finance. Despite costing north of £37,000 – a huge amount for a car so small – our A3 still doesn’t have much of the kit you’d get as standard on many cars half the price. Keyless entry, heated front seats, a reversing camera and front parking sensors are all notably absent, though these are standard on an ever increasing number of cheaper cars. Worse still, Audi has hiked the price since we picked up the car. The list price has gone up £470, but PCP finance costs have jumped up by more than £20 per month – from £402 to £424 (both on a three-year, 10,000-mile per year contract with a £4,000 deposit). That’s equivalent to more than 5% over barely six months and means that you’ll have to spend an additional £738 to finance the car for three years. Meanwhile, you’ll be £487 worse off overall if you were to finance the car now and buy it at the end of the contract. 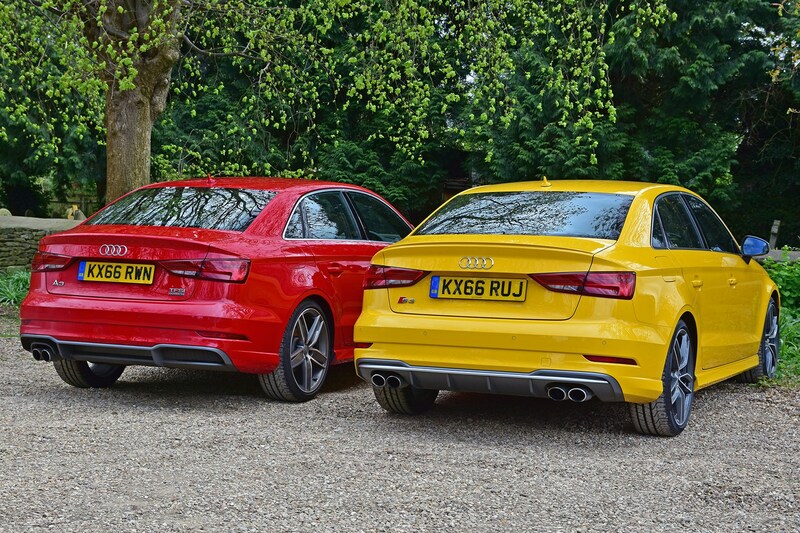 Sweetening the pill, however, Audi is finally fitting rear parking sensors as standard – saving you £425. 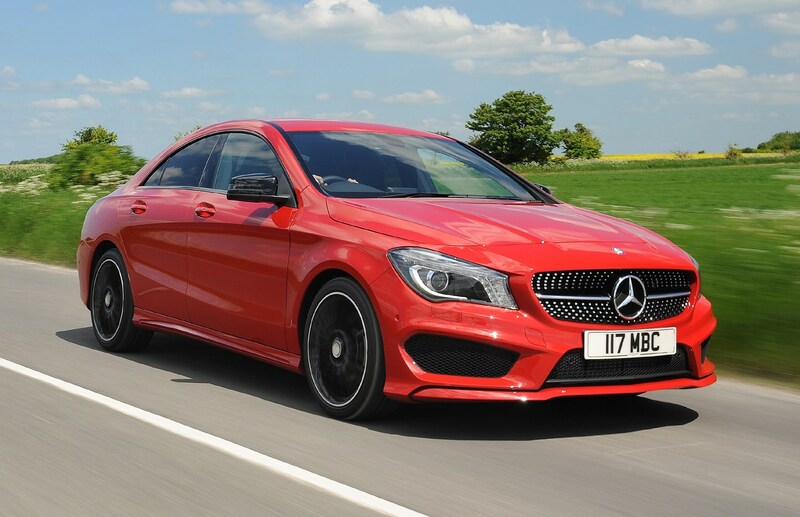 On a different note, we’d steer clear of the optional 19-inch alloy wheels fitted to our car, as these make the ride simply too firm for British roads – even with the optional adaptive suspension that you have to pay for alongside the larger wheels. The wide rubber also throws up a lot of noise on the motorway, detracting from its cruising ability. Which version would we go for? Our A3 is far from a bad car, but it’s very hard to recommend when it’s barely cheaper than the fun-to drive range topping S3 and is much pricier than the equally stylish A3 1.5 TFSI S Line S tronic. The main appeal of the A3 is its posh cabin, streamlined silhouette and slick automatic gearbox. However, you can take advantage of all of these for a much more palatable price with the 1.5-litre model. And we’d be very tempted to do just that, considering the five-door Sportback for a lower price still and more usable rear seats. While we’ve yet to drive this specific model, it’s not down on power too much compared with our long-termer – especially when you consider it’s substantially lighter – and it’s around 15% more economical on paper, too. That’s enough to get our vote. If money, weren’t an issue, though, we’d consider the 310hp S3 Saloon. This provides far stronger performance, a much more exciting drive and greater comfort for just a little more than our test car – making it much better value despite the higher price. 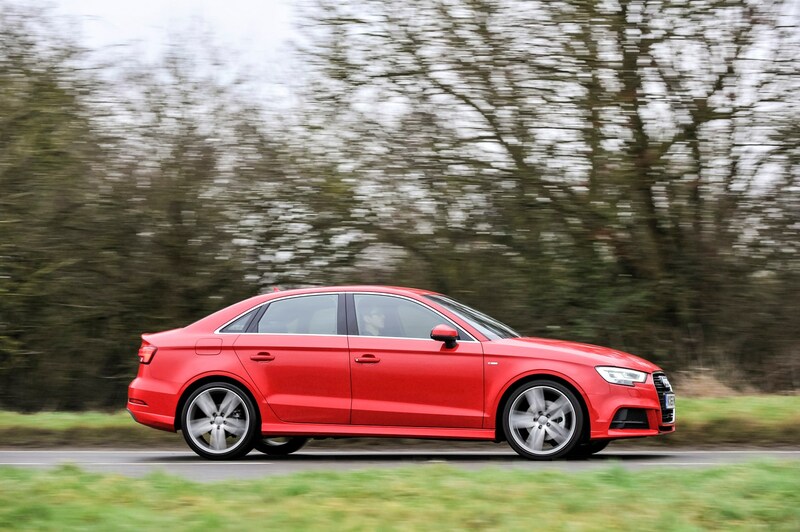 As an upmarket car with an upmarket price tag, it’s unlikely that low costs are top of your shopping list if you’re considering an A3 Saloon. However, it’d be nice to think that you wouldn’t have to shell out too much in fuel bills with one; especially as our 2.0 TFSI Quattro S Line model claims to be capable of an impressive 47.9mpg (with optional 19-inch wheels). But, that hasn’t been the case. Despite the economy inching up from a very low 30mpg after the first 1,500 miles, it’s risen to a mere 33.7mpg – 30% short of the official claims – over more than 11,000 miles. It’s not unusual for new cars to fall far short of published figures – as the official tests don’t reflect real-world driving – but to miss by such a margin is disappointing. This is especially true as we’ve been consistently underwhelmed by the performance on offer from our car’s 2.0-litre engine. 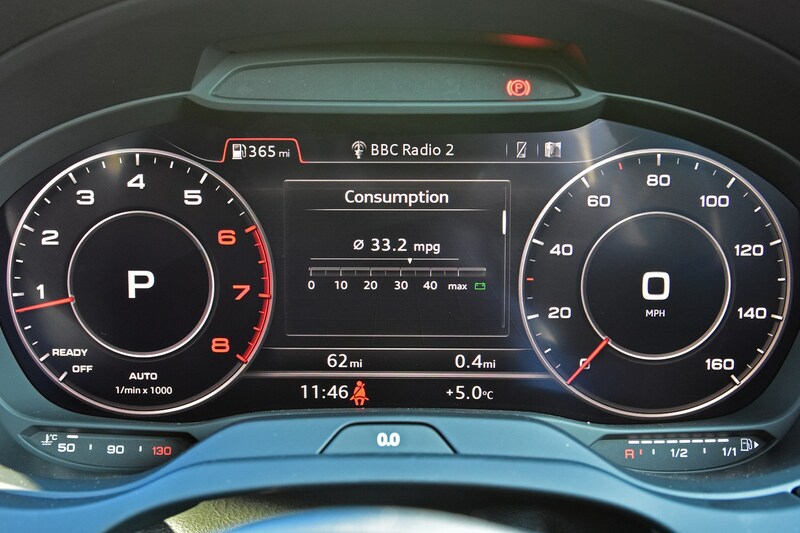 Having topped the tyres up to the correct figure – underinflated tyres mean worse fuel economy – we noticed an instant jump in economy, hitting a high of 41.0mpg over 344 miles, though this involved vein-popping concentration and clear roads. With reasonably gentle driving, we’d wager that you’d return around 36mpg with our A3. Even so, we’ve spent £1,794 on fuel over the last 11,082 miles – that’s £534 more than we would have done, had the car achieved the official figure. One way of spending less at the pumps is to ditch the heavy all-wheel drive system, which adds an additional 85kg to the car’s kerbweight. Opt for the two-wheel drive automatic model and the claimed figure rises to 48.7mpg (with matching 19-inch wheels). 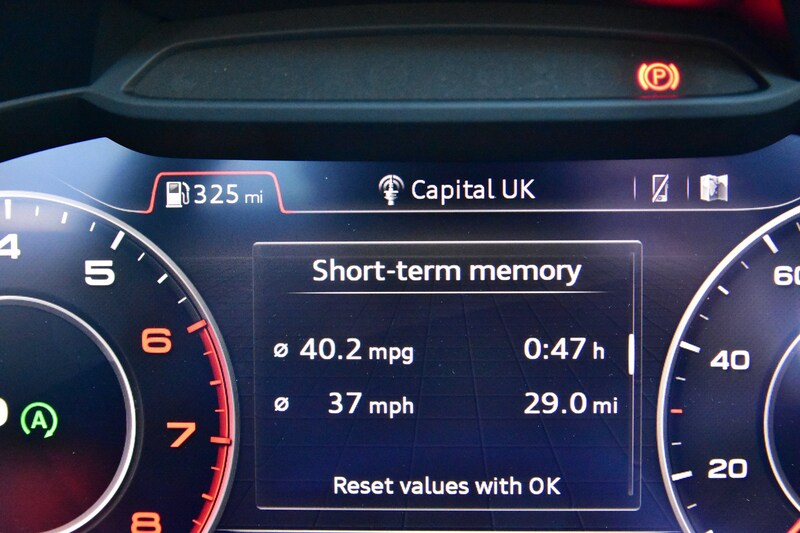 This is a surprisingly small difference, but we’d wager that you’d see much more than 33.7mpg we’ve been getting, from the lighter two-wheel drive 2.0 TFSI model. 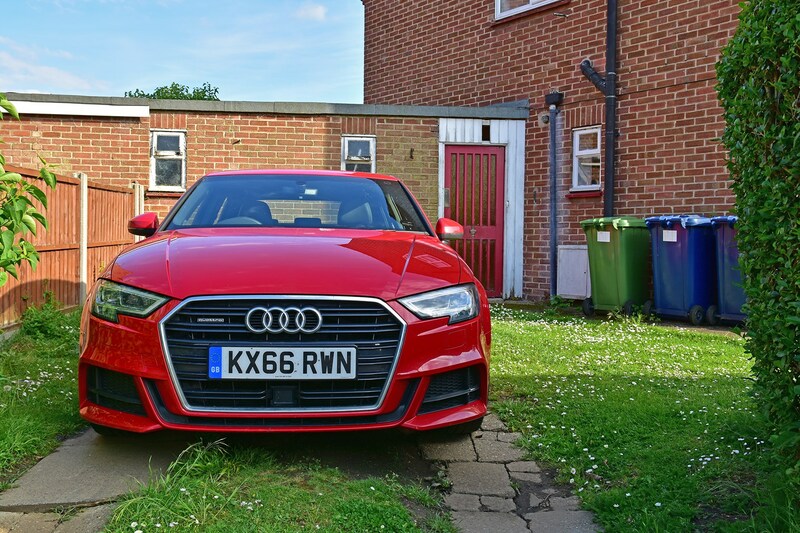 With much more mid-range punch, we didn’t see notably lower economy from the S3 Saloon we compared previously – as you can travel at a similar speed without taxing the engine as much. As this model shares our car’s all-wheel drive system and feels dramatically faster, it makes a much more appealing prospect. Our time with the A3 is coming to an end, after around six months and 11,000 miles. Find out all our conclusions – what we love and what we hate – in our next, and final, update. We’ve complained about the A3’s comfort – or the lack of it – in several of our long-term updates. However, while we find the high driving position – which we attribute to the optional electric seat gubbins – and stiff suspension a bit grating, Parkers office manager Leise finds the Audi much more fitting. The simple dashboard layout that we’ve valued over the last few months is another plus point; ‘It’s one of those cars where you just get in and it’s very clear what everything does,’ Leise continues. Other positives come in the shape of easy controls, the supremely slick S tronic automatic gearbox and reversing sensors which make the A3 much easier to park – although for a car of this price we still find it hugely stingy that such kit doesn’t come as standard. 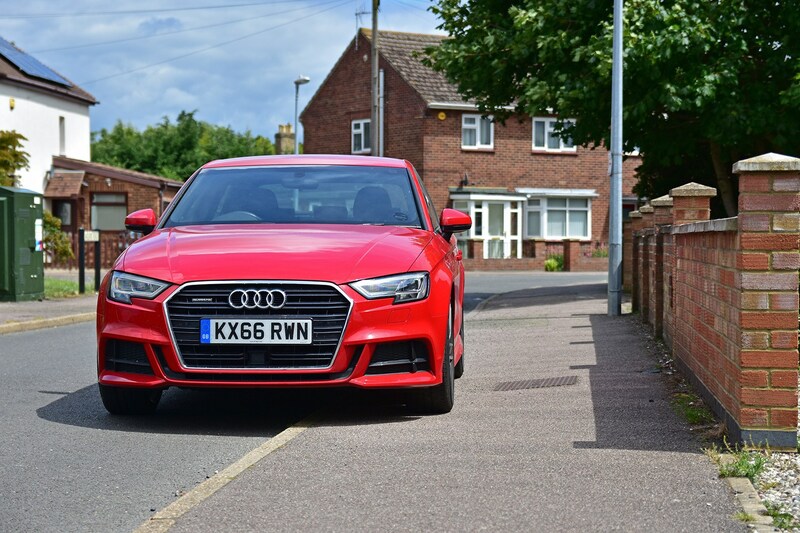 The way that the A3 Saloon channels the upmarket look of the pricier Audi A4 but in a smaller, easier to drive and more affordable package, is the icing on the cake for Leise. We say more affordable, but the price is the A3’s biggest flaw. Whether you opt for car finance or pay cash, there is no getting away from just how expensive our car is. It has more than £5,000 worth of options, but even so it’s hardly luxurious with numerous faster, more stylish, practical or better-equipped cars available for a similar cost. Other reasons for this come in the shape of the boot, which while a reasonable volume, struggles with big family shops and the rear seats, which aren’t the most practical. 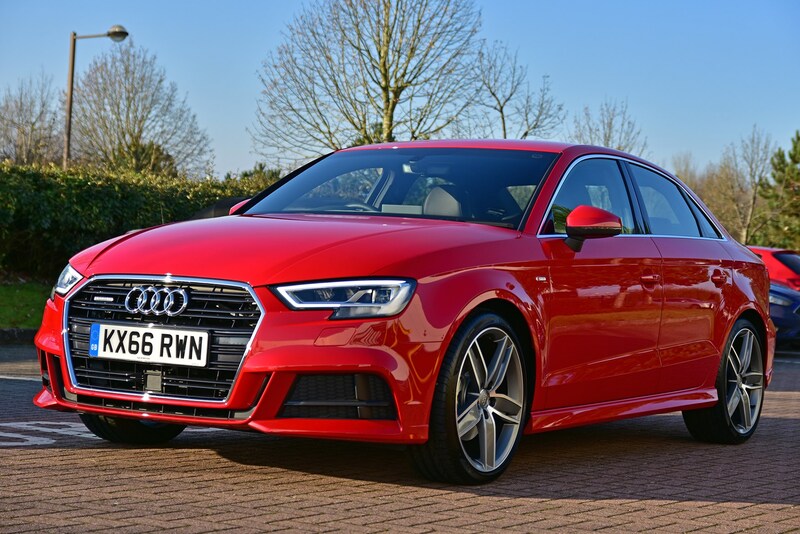 No one gets an Audi to save money, but we think more than £32,000 – the price has gone up since we took ownership of our red A3 – is way too much for a car that does without much of the kit you’d expect as standard in a ‘premium’ model. 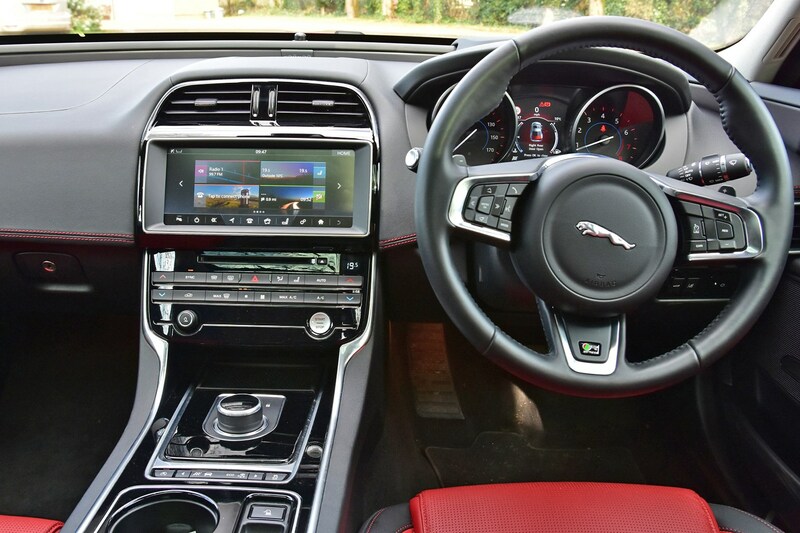 Rear parking sensors, heated front seats and leather upholstery are all missing from our A3, though they’re standard on the Jaguar XE 25t 250 R-Sport AWD. Yes the XE is a class above the A3 and accelerates faster, but there’s little difference in PCP monthly payments – especially when you consider the greater amount of standard equipment. That means that if you run the cars for three years and then hand them back, just £1,100 separates them. Bear in mind that to add the rear parking sensors, heated front seats and leather upholstery that the Audi lacks compared with the Jaguar, you’d have to spend an additional £1,945. That makes the Jaguar a surprisingly similar proposition. So how do they compare on the road? With 250hp on tap compared with 190hp in the Audi, the Jaguar feels much more sprightly; that despite an identical 0-62mph time of 6.2 seconds. Neither engine feels that sporty – and both sound a little coarse when worked hard – but in terms of performance, the XE seems a step up on the A3. Where there’s a real difference between the two, comes in how well they absorb bumps. 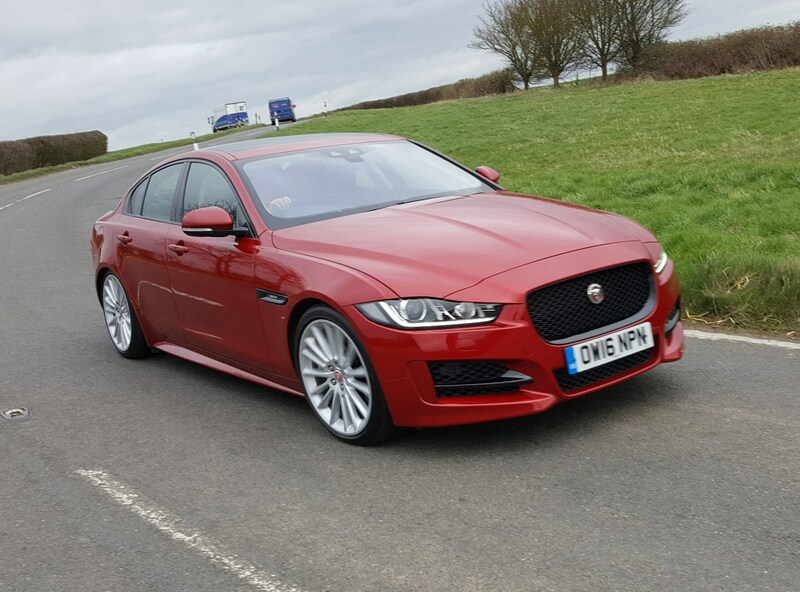 True to its Jaguar heritage, the XE has very comfortable suspension, soft even, smothering bumps in the road much more effectively than the stiff Audi. As a result, it also feels less nimble around bends; while the A3 is not particularly sharp it grips much harder than the XE, which slides its front wide in corners without you even going that fast. 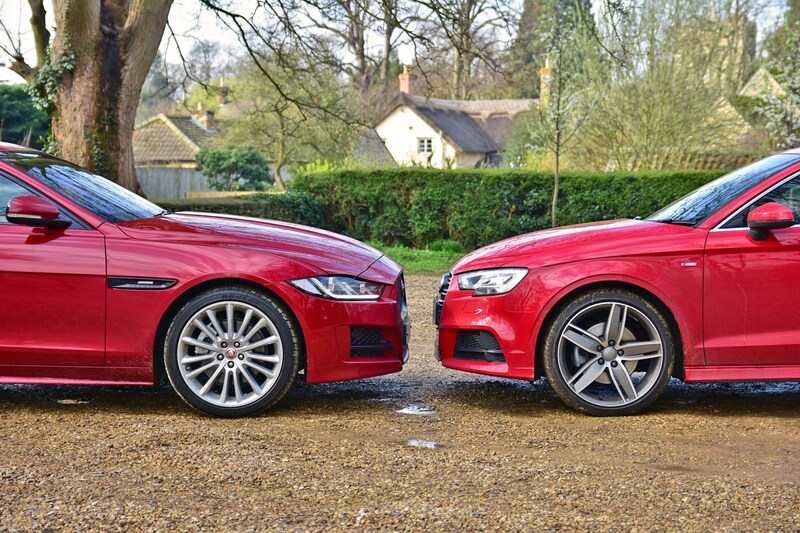 The XE also rolls more if you turn into corners at speed, where the Audi remains more level. Another difference comes through the steering wheel; despite sharp, precise steering, the Jaguar doesn’t provide much sense of how much grip the front tyres have. Meanwhile, the Audi – with its Magnetic Ride adaptive suspension and variable steering weight – offers much greater steering weight in the Dynamic drive mode, providing a greater sense of confidence. 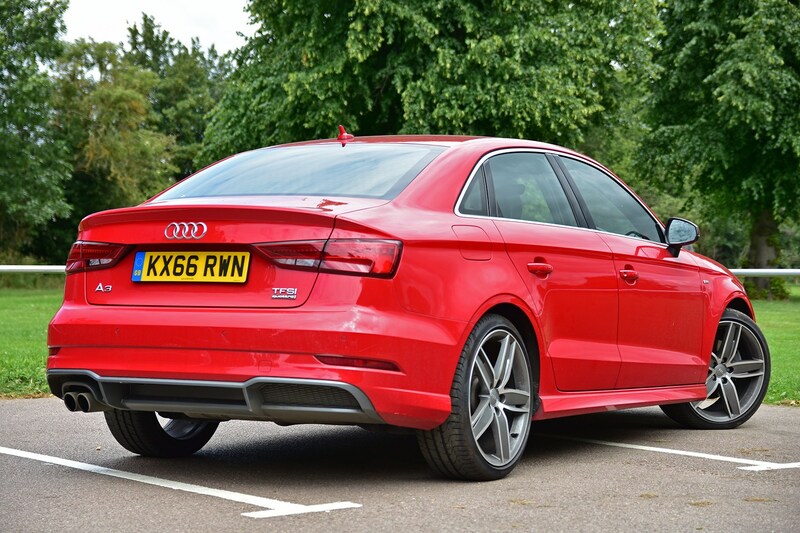 The A3 also wins points back with its far smoother, faster-to-respond automatic gearbox. However quick or slow you’re going and whether you suddenly change your speed without warning or not, you can’t confuse the S tronic gearbox. It always shifts smoothly, quickly working out which gear you want. More than this, equipped with all-wheel drive and an automatic, it’s the A3 that is more economical, with claimed consumption of 48.7mpg against 42.2mpg for the Jaguar. Admittedly, we’re way off that figure, averaging 33.3mpg currently, but judging on the XE’s trip computer during our drive, that car could be even further adrift of its official figure. 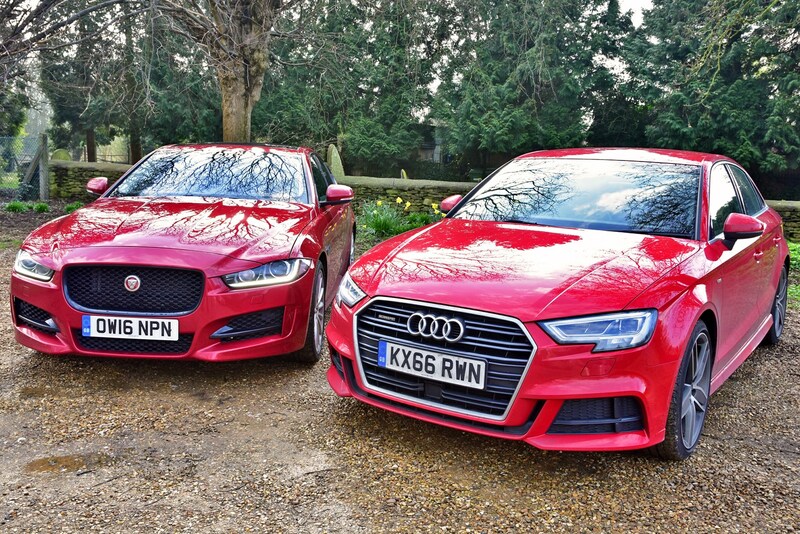 Which is better: Audi A3 Saloon or Jaguar XE? Both the A3 and XE are flawed cars; the Audi is too expensive, not comfortable enough on rough roads and doesn’t ever feel as fast as the figures suggest, while the XE has a cheap feeling interior and isn’t as sharp as keen drivers will want in the corners – and neither has the most usable rear seats. Audi and Skoda sit at opposite ends of the Volkswagen Group, sharing engines, gearboxes and other kit, but having vastly different price tags. That means that if you want some of Audi’s high-tech kit but don’t want to pay top dollar for the privilege – and are happy to sacrifice a little of the Audi upmarket feel-good factor – opting for a Skoda could be a savvy move. 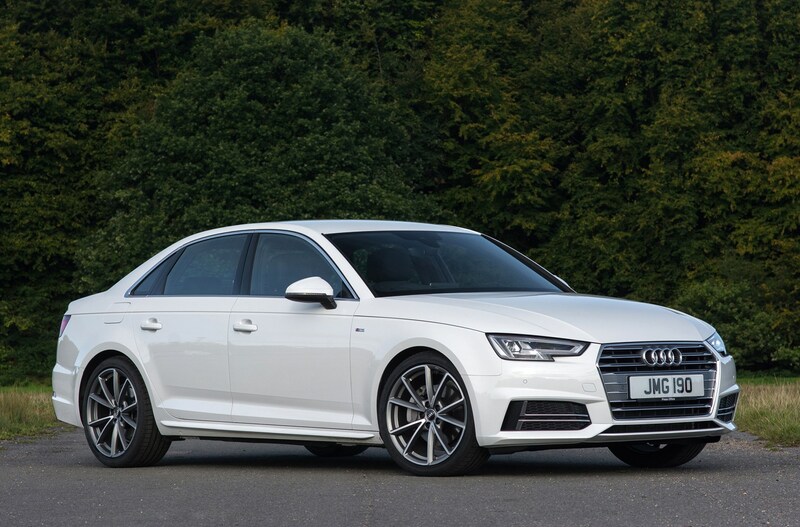 Equipped with just a few pricey options, our £37,640 A3 would set you back a whopping £606 per month on a three-year, 10,000-mile-per-year PCP finance contract with a £4,000 deposit – or around £420 per month without any options. Considering our near-£38k car still lacks tonnes of kit you’d expect for the price – such as front parking sensors, a reversing camera, heated seats, uprated speakers and leather seats – you’ve got to really want that Audi badge. In comparison, the Skoda Superb Estate has essentially all the same kit as our A3 standard plus a rear-view camera, adaptive headlights that swivel as you turn the wheel, keyless entry and Lane Assist. Despite that, it will set you back just £10 more per month at £616 per month. Furthermore, you get an additional 90hp from the turbocharged 2.0-litre engine, which means that the Superb sprints to 62mph in a more rapid 5.8 seconds compared with the Audi’s 6.2 seconds – with the difference feeling even greater than that. That makes the Audi seem ludicrously expensive compared with the Skoda. So where does it trump the Superb? Step into the A3 and it feels like a more upmarket product. Rather than the Skoda’s conventional touchscreen media system, you get a pop-up screen with a slick rotary controller. We’d wager that the Superb screen is more crisp, but the Audi’s rotary dial makes setting the sat-nav or changing the drive mode far slicker. Throw in the A3’s digital dials, which let you control most car functions through the steering wheel buttons on the screen in front of you – rather than having to look away from the speedometer at the main media system – and it’s a much more satisfying, less distracting experience. The materials also feel more plush, with the minimalist interior adding to that impression. The cupholders can also accommodate a number of different size bottles, including larger 750ml ones, where the Superb can only fit small ones. And we can’t think of anything else. 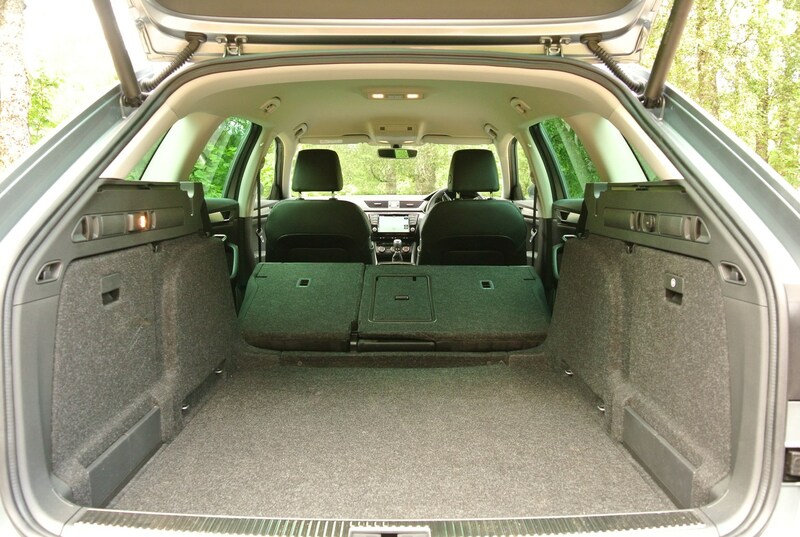 In comparison, with its estate tail, the Superb offers a boot that is more than twice the size with the rear seats dropped, a huge amount of extra head- and legroom for rear passengers, plus a more satisfying drive. Though it has the same size 19-inch alloy wheels, the Skoda rides more smoothly while feeling sharper around corners. We also found the sportier-looking front seats more comfortable, too. If you thought the larger Skoda would chug through more fuel, even that isn’t proving the case; Keith has chalked up 31.1mpg over the first 2,000 miles of ownership. 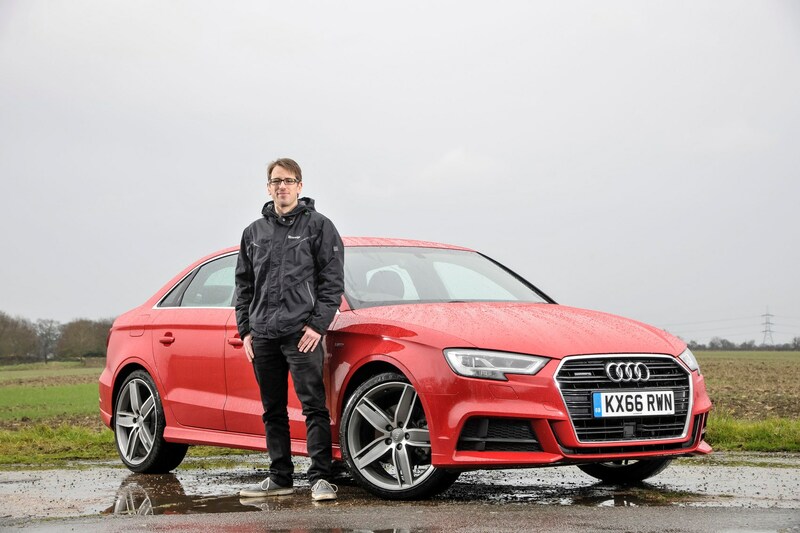 Rewind to that stage with the A3 and we’d returned just 30.9mpg – despite the Audi offering claimed fuel economy of 47.9mpg, compared with 39.2mpg for the larger car. This might sound like we have a downer on the A3, but that’s not the case. It is beautifully built and makes an interesting alternative to diesel versions, but it is spectacularly expensive considering how underwhelming the engine is compared with the performance figures and how little you get for your money. If you’re not wedded to the Audi badge, then considering the Superb could get you a far more rounded car for just £10 more per month – and if you’re looking to own your car at the end of the PCP finance contract, you’ll actually have saved £1,171 by choosing the Skoda over the Audi. With its sloping roofline and saloon tail, our A3 isn’t the most practical car – whether you’re carrying a full set of passengers or cramming kit into the boot. However, we’ve found that it works far better as an office, courtesy of seats that are more comfortable for lounging than driving, plus a reliable, mostly crisp Bluetooth connection. 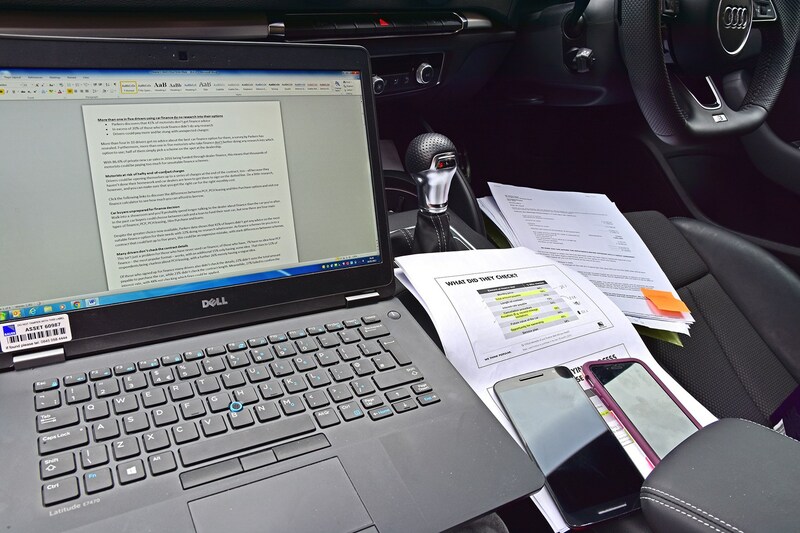 The prospect of house-moving duties meant that I was out of the office when BBC Radio 4 got in touch to talk to Parkers about our car finance research that found that more than one in five motorists taking finance do no research into their options. With the choice between recording in an empty – and echoey house – or sitting in a padded car, I decided upon the Audi. Sliding the electric passenger’s seat back you realise that life is much better for those in the front seats than those in the back; there’s plenty of room and the seat that doesn’t hold you in place that well when driving becomes much more comfortable. Secondly, you get to appreciate the simplistic design of the interior and how solid and high quality everything feels. We think the combination of super-saturated red paint and supersized 19-inch alloy wheels outside with a sober interior accented by slivers of silver inside, works pretty well too. We’re spotting more and more A3 Saloons on the road, but ours still stands out. 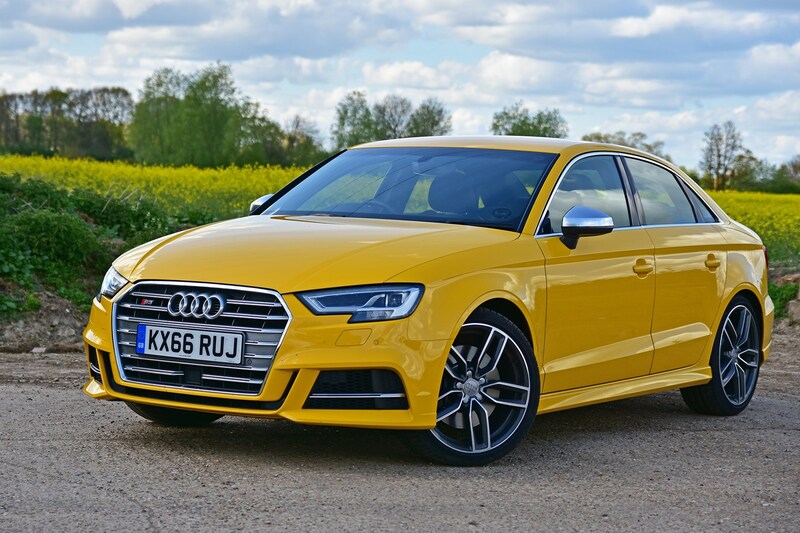 Granted, we are feeling increasingly envious every time we see an S3 Saloon, as our previous comparison found that car was by far the more sporty, desirable – and more comfortable, even – option. Sitting in the A3 talking about finance did remind us of the car’s biggest failing, however; the price. A small saloon it may be, but ours would set you back a near-obscene £606 per month with options. That’s £119 per month more than a standard Audi S3 Saloon with the same contract terms. It’s £82 per month more than the even more powerful, upmarket Audi S4 Saloon. 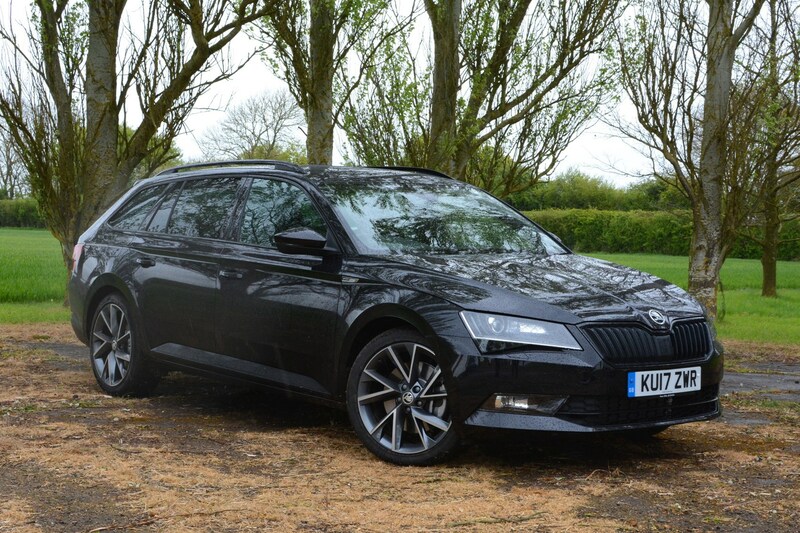 Demonstrating just how expensive our test car is to finance, you could get a fully-loaded Skoda Superb Estate 2.0 TSI 280 4x4 DSG L&K – complete with a more powerful 280hp engine, all-wheel drive and an Audi-matching DSG automatic gearbox – for just £601 per month. This top-spec model includes extras such as a 10-speaker sound system, heated front and rear seats, heated windscreen, Lane Assist, Park Assist, adaptive headlights that swivel in tandem with the steering and leather seats – all as standard. Shortly we’ll be pitting the A3 against Keith’s Superb Estate 2.0 TSI 280 4x4 DSG Sportline – which would set you back £536 per month before options – to see whether the posher Audi can live with the faster, more spacious and more comfortable Skoda. Audi A3 buyers have a choice of three-door hatchback, four-door Saloon and five-door Sportback – plus the Cabriolet. On the face of it our saloon looks like a good balance between style and practicality, with its sleek silhouette plus doors for rear passengers. However, that’s not the full picture. 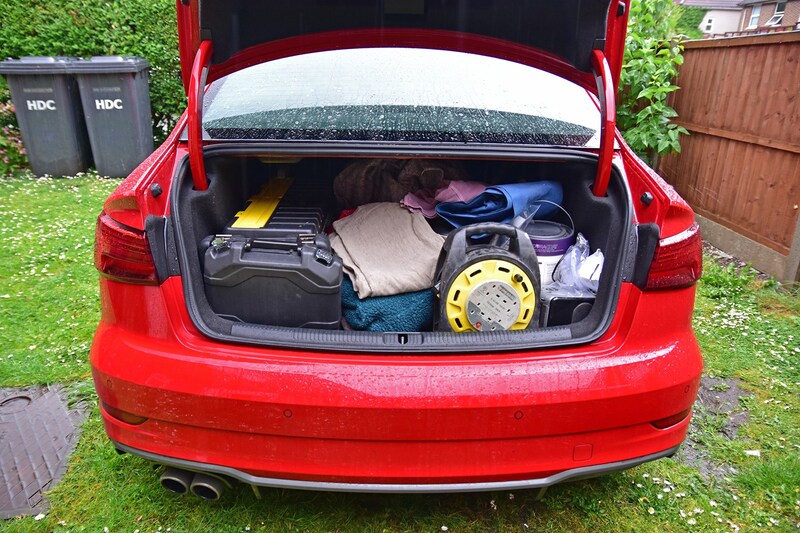 While space with the rear seats in use beats the hatchbacks – at 390 litres compared with 325 and 340 litres for respective Quattro all-wheel drive versions – fold the rear seats down and you’ve got 40% less space to play with than in the Sportback. The Saloon is also the priciest option, too, costing £565 more than the Sportback and £1,185 more than the three-door. 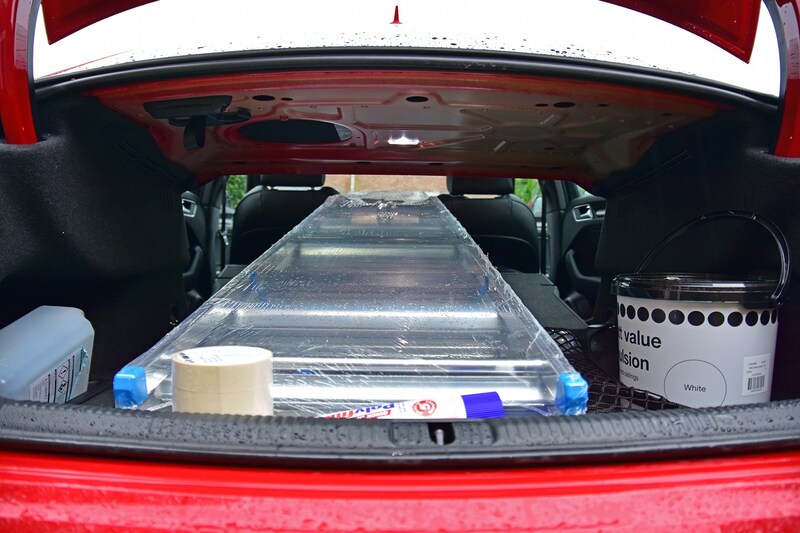 So the question is, is the A3 Saloon practical enough to cope with DIY duties? Loaded up with extension leads, old clothes, dust sheets, paint and toolboxes, the A3 Saloon’s boot swallowed a useful amount. 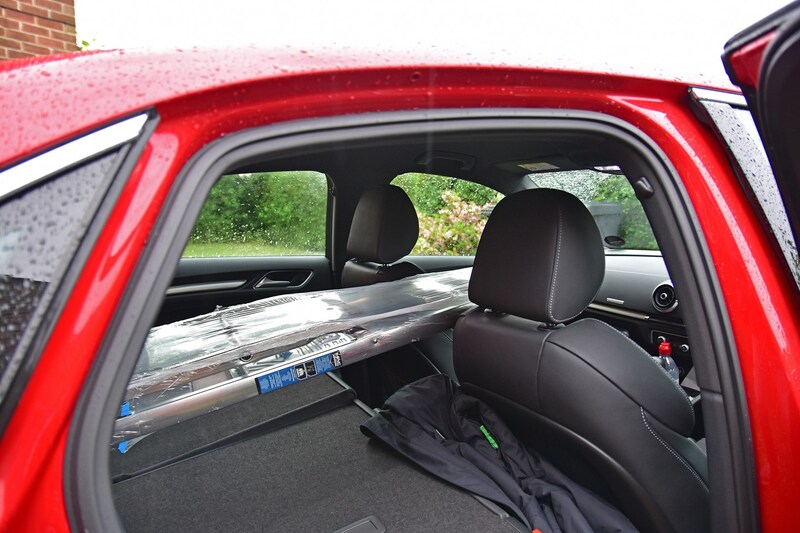 Despite having a saloon boot, the opening is wide enough to cram in large items easily and there’s a reasonable amount of height, meaning that if you pile kit on top of each other you can fit plenty in. 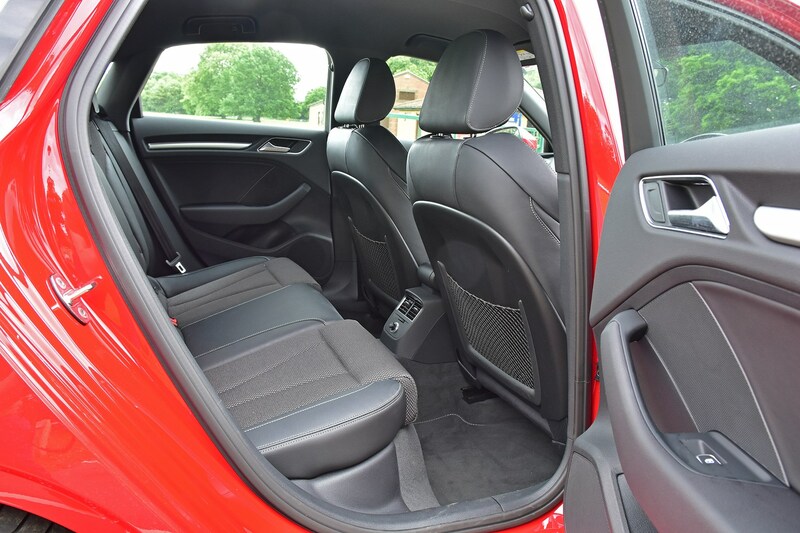 When you consider, however, that Keith’s very similarly priced long-term Skoda Superb Estate – with its gargantuan luggage area that can accommodate well over twice as much – offers much more space and power, the A3 is less impressive. And the A3’s limited size became more apparent when trying to fit in a relatively small step ladder. Yes it did fit, but this involved sliding the passenger seat nearly all the way forward and having the top of the ladder poking over the top of the front seats – not ideal. We have been making more use of the boot floor luggage net, though, which has come in handy for securing small items to stop them flying around. Similarly well thought-out are the cupholders. So often in cars, cubbies can’t cope with anything bigger than a 500ml bottle, but the A3’s snugly hold 750ml bottles, as do the front door bins. A small point maybe, but with many supermarket meal deals including the larger bottles, we’re endlessly surprised how few cars can hold these in place properly; a real irritation. Despite the thought that has gone into most of the A3’s interior, we’ve been disappointed by the optional electric front seats. 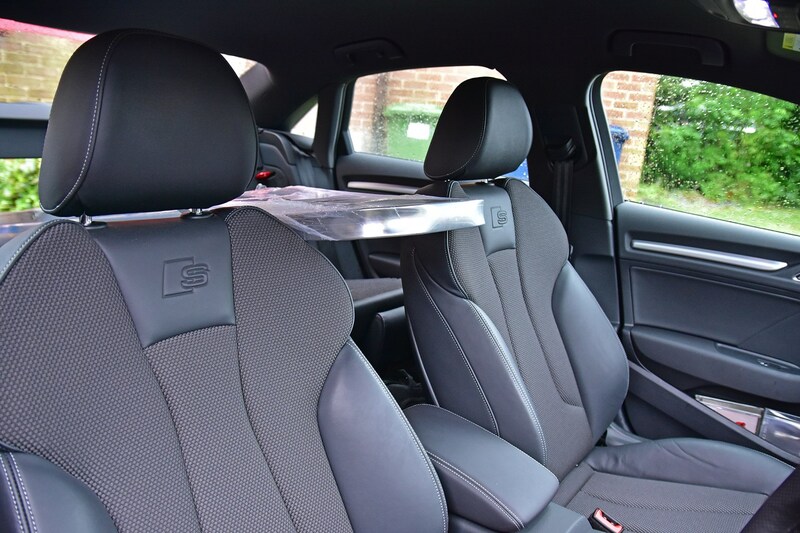 Jump into an A3 without them – like the S3 Saloon we referred to in a previous update – and you realise just how high our car’s optional chairs are mounted. Drivers after a low-slung, sporty driving position should not tick the electric seat box. We’re also finding these could be more comfortable – even with the optional electric lumbar support. There’s a reasonable amount of back support and they look like they should hold you in place around corners well, but we’re never quite as comfortable as we’d expect to be in a £37,000 car. On the positive side, since topping up the tyres our fuel consumption is on the way up and now stands at 32.8mpg. Though an improvement, this is still around 50% down on the claimed figure and pretty poor for a car that doesn’t feel particularly fast or exciting in everyday driving. 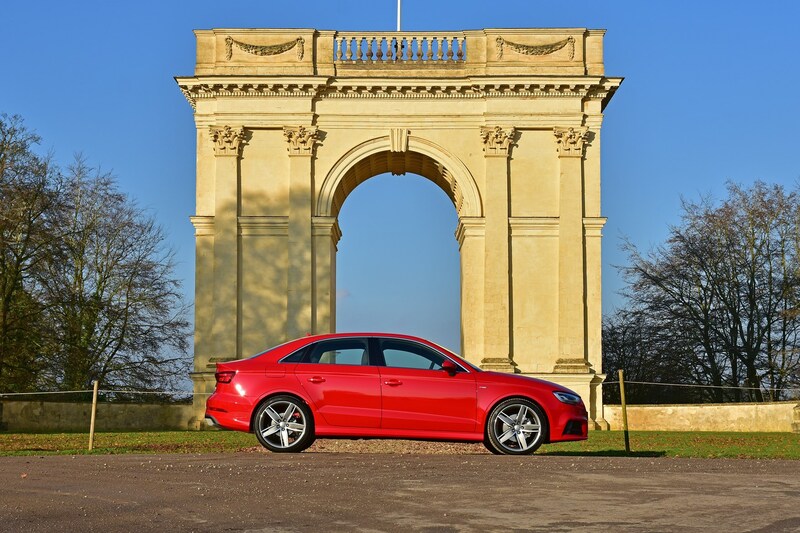 There are few affordable saloons that can coax you into glancing over your shoulder when you walk off, but in its tomato-red hue with sharp five-spoke wheels, our A3 is one of them. The optional 19-inch alloy wheels may scupper the ride and leave the A3 feeling lead-footed around bends, but they contribute to what is one very desirable machine. 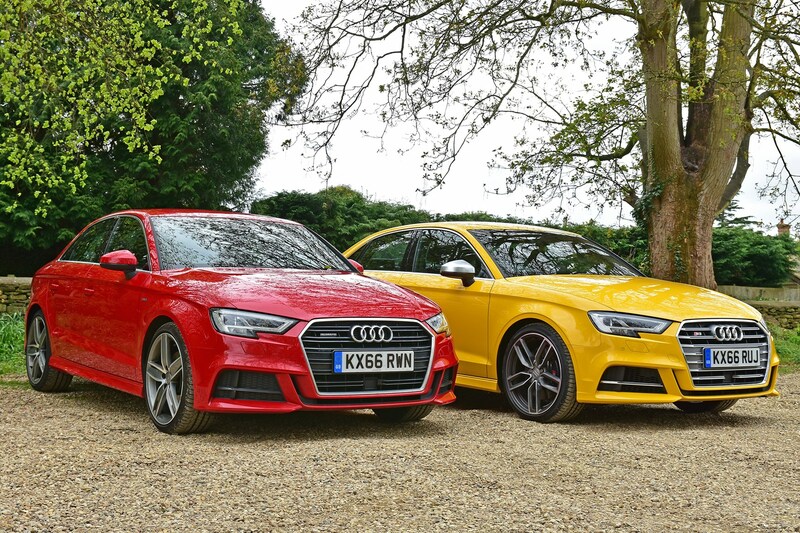 Yes, the S3 Saloon we tested previously in retina-searing yellow is even more attention grabbing, but our car lacks little of the pricier model’s visual punch while proving a bit more grown up – partly thanks to the absence of the S3’s tacky silver door mirror caps. Inside, however, the A3 very much subscribes to the less-is-more mantra. In-car media systems are becoming home to more and more features, but thankfully the A3’s offering is pretty easy to use, considering how many functions it controls. This is particularly good news since our test car features £1,395-worth of Technology Pack Advanced, complete with more comprehensive sat-nav directions and live traffic info. That option pack adds the ability to handwrite on top of the rotary controller to enter sat-nav addresses, for instance, which can be quicker than scrolling the wheel to select letters on-screen. You also get more detailed sat-nav instructions, showing which lane you need to be in and working out different routes as and when traffic changes. These may sound like small features, but together they add to the A3’s feeling of quality, and help to avoid the sat-nav rage caused by lesser systems that keep taking you back to the same traffic-clogged route, or force you to painstakingly select letter-letter-digit-digit-space-digit-letter-letter every time you want to enter a postcode. 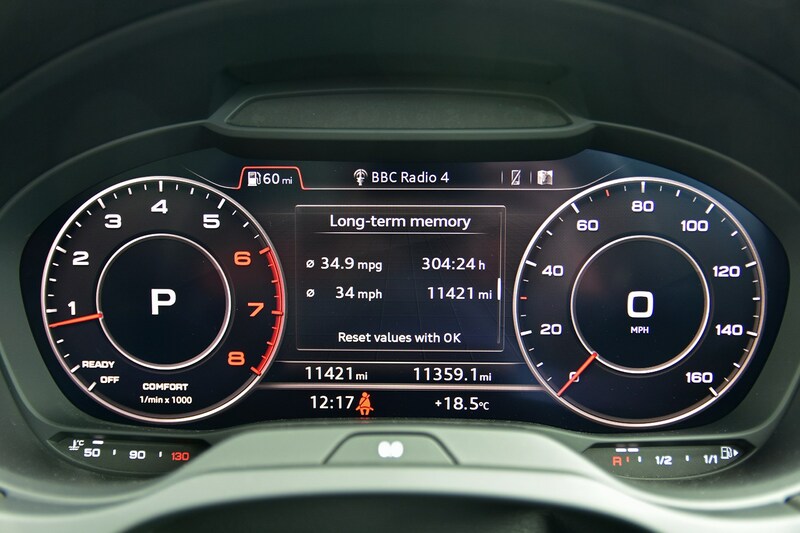 Adding to the A3’s sophisticated feel are the digital dials in place of the speedometer and rev-counter. 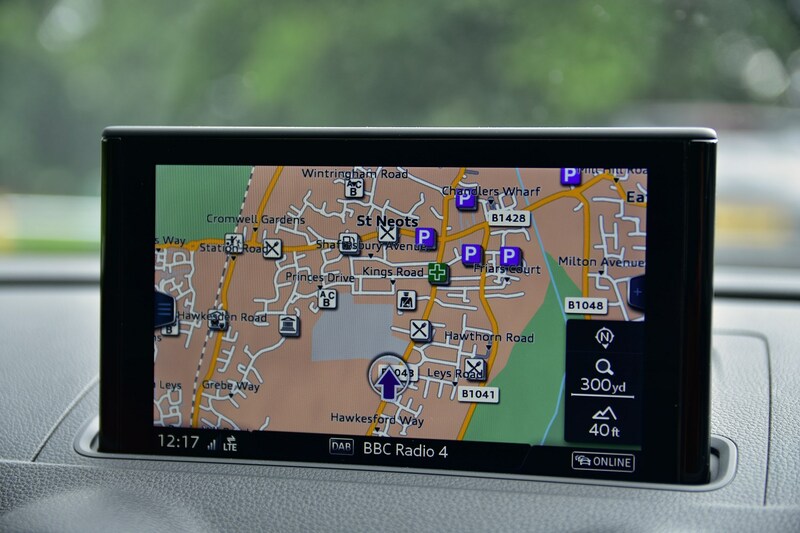 Part of the Technology Pack mentioned above, these allow you to display the sat-nav map across the whole width of the screen, scroll through radio stations and select phone contacts to call. While this may sound distracting, the layout of controls on the wheel and clear display means that you can use these functions without diverting much attention from the road ahead. There’s even a button on the wheel that can repeat the last sat-nav instruction when pressed – perfect when you’re on a busy road and want to make sure you’re in the right lane. Yes the A3 is very well designed, but you don’t get much for your money. The starting price for our test car may stand at £31,750 you still don’t get reverse parking sensors included – even though they’re standard on a £10,465 Skoda Citigo. Instead you’ll have to shell out an extra £425. Meanwhile, heated seats are a further £300, and if you want wireless phone charging capability that’ll set you back £325. Keyless entry and start is a further £400, and a rear-view camera £375. Even topping the three-year warranty up to five years and 90,000 miles – beaten by Toyota, Hyundai and Kia as standard – is a further £545. Not all buyers will want this kit, but we think what you get for the best part of £32,000 is pretty stingy. Especially considering the fact that you don’t get that much in the engine department. While the A3’s styling and high-quality cabin will impress in the showroom, the lack of equipment for the money is likely to grate after a few months. One area where the A3 is starting to improve is fuel economy. The last 1,500 miles have seen our overall average figure rise from 30.8mpg to 31.9mpg. That’s still 50% down on the claimed figure, meaning that you shouldn’t choose this A3 if you hope to cut your fuel bills, but we have seen up to 38.2mpg on individual tanks. We expect the A3’s economy to continue to improve as we put on more miles, but it’s still a long way adrift of what we’d hope for from a car that doesn’t feel particularly fast. We have, however, just topped up the tyre pressures – one factor that has a significant impact on fuel economy – putting them on the car’s harder economy setting rather than the lower, comfort level. Higher pressures mean less resistance from the tyres, so there should be a noticeable drop in fuel consumption. However, more air in the tyres also means potentially less grip in the wet and a firmer ride, as there’s less give from the wheels, so we’ll closely monitor what impact this has on the A3’s driving characteristics. We’ve already mulled over how our A3 compares with the cheaper 1.4 TFSI petrol, but our car – with options – is actually pricier than the range-topping S3. All this despite the S3 Saloon packing a hefty 120hp more, plus some desirable additional kit as standard. The list price for our long-termer – the A3 2.0 TFSI 190 S Line S tronic – stands at £31,750 compared with £36,955 for the S3 Saloon with standard-fit Quattro all-wheel drive and optional S tronic automatic gearbox. However, our test car works out at £37,160 with a sprinkling of optional extras. Kit our A3 out with the same features as the standard S3 and you’d need to spend an additional £3,690, meaning that the difference in cost shrinks to just £1,515 and the finance costs are likely to favour the more powerful car. But there’s much more to the S3 than simply greater value than our A3. With no less than 310hp pumped out from its more highly tuned turbocharged 2.0-litre engine, the S3 has enough muscle to match a £52,000 Porsche 718 Cayman S in the 0-62mph sprint. Despite the jump in power, traction remains complete, with the S3 transferring power to the road through all four wheels, as our red A3 does. 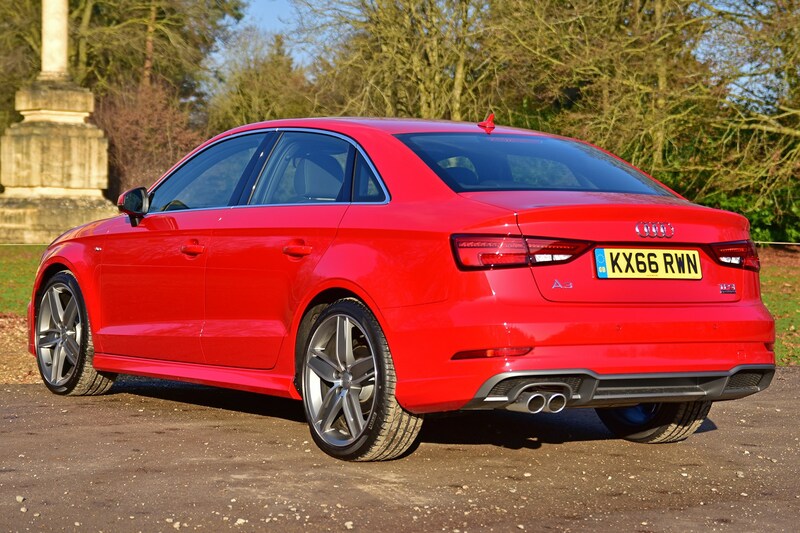 While our long-termer pulls strongly from low engine speeds but tails off quickly when worked hard, the S3 pulls with greater ferocity the more you ask from the engine. The S tronic automatic gearbox is slick in our 2.0 TFSI 190 model but seems even more intuitive and fast-reacting in the S3. Whether you’re dawdling or zooming along a twisty country road, the gearbox does a very good job of working out which gear you want. 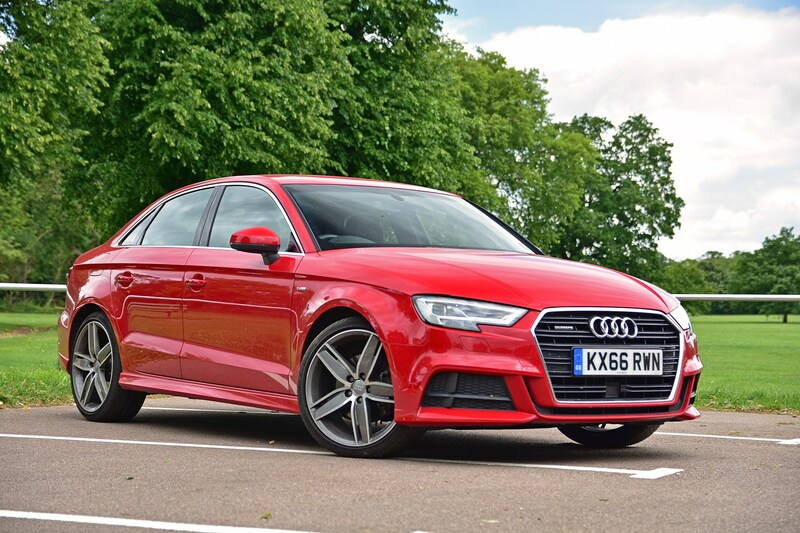 Surprisingly, though the S3 is the sportier model – and features 19-inch alloy wheels and magnetic adaptive suspension like our long-termer – it manages to be more comfortable. The suspension is stiffer, with less give and a reduction in bodyroll around corners, but it manages to smother bumps better with less noise making itself heard in the cabin. Neither car makes the most comfortable long-distance cruiser – with lots of road noise and the large wheels making a racket at higher speeds – but as you’re sacrificing a little refinement over lesser A3s in both cases, it’s the S3 that makes the better all-rounder, with the performance to live up to the firm ride. 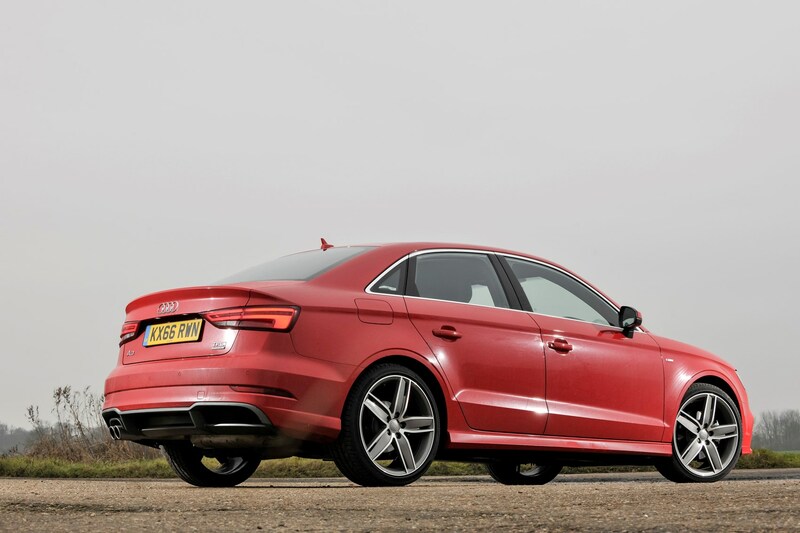 More direct steering and the quicker gearbox only add to the S3’s responsive feeling. 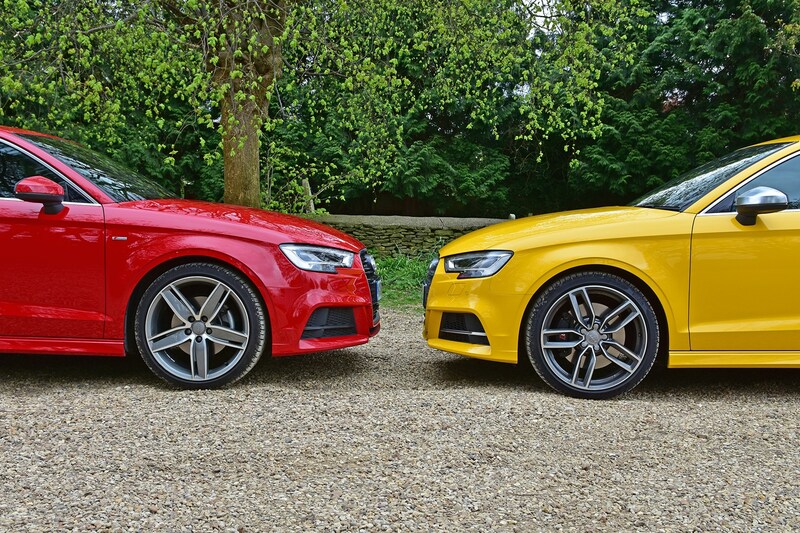 The Audi A3 Saloon is not a cheap car, residing above the A3 hatchback in the price stakes. However, our 2.0 TFSI 190 Quattro model sits uncomfortably close to the top of the price list, considering the chasm between it and the S3. While it looks good – especially with its bold red paintwork and optional 19-inch alloy wheels –, it isn’t comfortable enough to make it a refined cruiser. Meanwhile, the large wheels and stiff suspension that detract from comfort levels sadly don’t help the A3 to live up to the S3’s impressive roadholding. The engine is also several rungs down on the S3. Meanwhile, if you don’t need the Quattro all-wheel drive, the £334 per month 1.4 TFSI S Line S tronic (£314 in manual form) seems a better value way to get the A3’s sharp looks and upmarket interior. We have to admit, though, that we’re mightily tempted by the S3 after spending a lot of time with one this week. Now we’re chalking up the miles the fuel economy has thankfully topped the 30mpg mark, reaching 30.8mpg. The engine is also starting to feel a bit more punchy than it did when we picked it up. 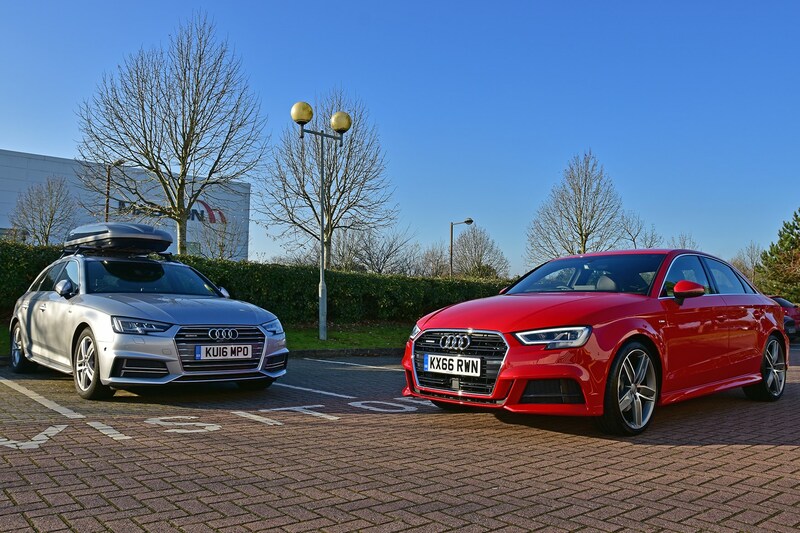 As the A3 seems to be getting better with age we’re intrigued to see how it stacks up against its range-mates and a few other rivals over the next few months. With the miles racking up past the 1,000 mark, our A3 is now run in and we can make full use of the turbocharged 2.0-litre engine. An impressive claimed 0-62mph acceleration figure of 6.2 seconds means that our A3 stands alongside some pretty powerful machinery in the performance stakes; at least on paper. Now we’re able to use the motor’s full power, however, it’s been a pretty disappointing experience. With a hefty amount of low-down torque, the A3 pulled hard and picked up speed easily when we were running it in and limited to lower engine speeds. Unshackled by the need to drive gently, however, we’ve realised that the motor doesn’t offer much more muscle when you work it harder. Could cheaper 1.4 TFSI petrol be a wiser choice? With all-wheel drive meaning that there’s no wheelspin under full throttle and a super-quick-shifting S tronic automatic gearbox, it seems that the A3 is flattered by its 0-62mph test rather than being a particularly quick car. We understand that you can only use so much power on the road, but if we’d spent several thousand pounds more – or an additional £109 per month – on this than a 1.4 TFSI model in matching S-Line trim, we’d be pretty underwhelmed. Engine refinement – one of the key reasons many drivers pick a petrol over a more economical diesel – could also be a little better, we’re discovering. The gearbox often changes gear early, meaning little engine noise and better economy. However, the transmission occasionally shifts so early that the engine struggles, with additional vibration felt in the cabin. Flatten the throttle, on the other hand, and there’s quite an under-bonnet din as the revs rise. The gearbox is still very impressive in everyday driving, though, changing down nearly instantly when you call for more acceleration and shifting up imperceptibly when you lift off the throttle – apart from a few occasions when the temperature dropped to near-freezing, that is, when the gearbox became jerky and dim-witted. It hasn’t done the same since, though, so we assume these were isolated quirks. We’ve been monitoring the A3’s fuel economy since we picked it up and we’re miles adrift of the official economy figure of 47.9mpg (with 19-inch wheels fitted). It’s not unusual to struggle to meet official fuel consumption claims, but chalking up barely 60% of Audi’s figure with particularly gentle run-in driving is pretty galling. This means that we’ve already spent an additional £100 in fuel than we would have done had the official figure been achievable in real-world driving, over just 1,440 miles. Hopefully our fuel economy will improve as we cover more miles in the A3, as is often the case with new cars. The 19-inch wheels that dent fuel economy also do no favours for comfort. With little rubber separating the rim from the road, the ride in our A3 is unexpectedly firm. More than this, the wide tyres throw up a lot of road noise, especially on rough roads. This can make long journeys tiring, should you encounter some of the UK’s more neglected roads. A final irritation comes in the form of the flat-bottomed steering wheel. While such kit makes sense for F1 drivers who need the added space for their legs and barely need to turn the wheel to reach full lock, this faddish feature is no more suitable on a road car than fitting tyres of the same shape, with parking manoeuvres forcing you to constantly shift your grip as you turn. Were this a sub-£20,000 entry-level A3 maybe these quirks would be less annoying, however they’re a lot harder to accept on a £37,165 car. We’ll be keeping an eye on whether the engine and suspension smooth themselves out over the coming miles and whether we get used to the misshapen wheel. With most new car customers funding their vehicle with PCP finance rather than paying cash, it’s our A3 Saloon’s monthly costs that are likely to be more relevant to potential buyers than the list price. Whether you hand the Mercedes back at the end of the contract or make the optional final payment to buy it, the A3 is nearly £5,000 less overall – despite being faster to accelerate, and offering greater claimed fuel economy. First impressions of our A3 Saloon are very good, though, with the minimalist interior feeling chic and high quality and the engine and gearbox making for swift, easy progress while we’re running it in with gentle driving. The big wheels do make the ride surprisingly stiff for a modern car – despite £995’s worth of adaptive suspension, which should make the ride more absorbent to compensate for the large alloy wheels – while fuel economy is currently miles off the official figure, languishing below the 30mpg mark so far. So, over the next few months we’ll be assessing whether the A3 warrants its high price with its plush interior and four-wheel drive for impressive all-weather grip or if you’re better off getting a lesser Audi or getting the most bang for your buck with an upmarket rival. First update: Junior A4 or expensive A3 hatchback? Our long-term Audi A4 Avant has gone, but in its place we’ve just collected an Audi A3 Saloon 2.0 TFSI Quattro 190 S Line S tronic. 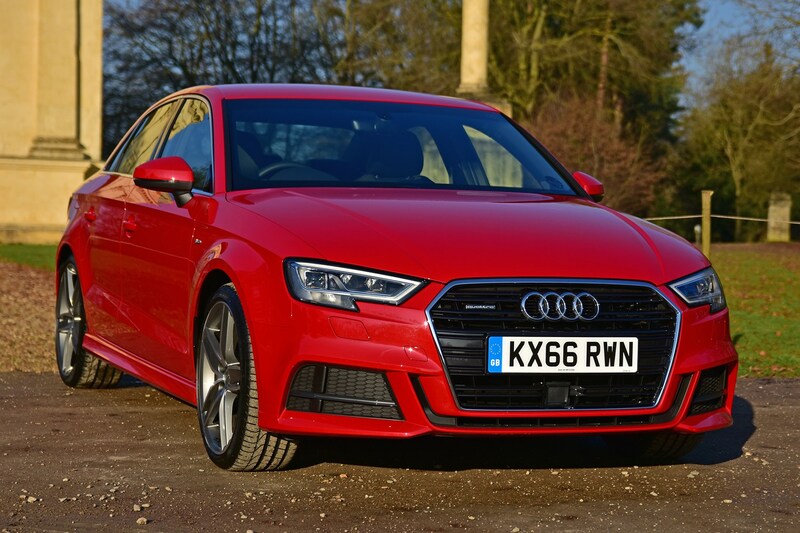 Audi’s sleek smallest saloon is a handsome beast – especially in zingy Tango Red. In turbocharged 2.0-litre petrol form with all-wheel drive and a dual-clutch automatic gearbox there should be plenty of substance to back up the style. And you’d hope so, too, since our test car weighs in at £31,750 – £37,165 with the smattering of options fitted to our test car. With 190hp channelled to all four wheels this A3 sits one rung below the S3 Saloon range-topper and comes in sporty S Line trim. As a result, it is capable of sprinting to 62mph in just 6.2 seconds despite being able to return 47.9mpg according to Audi. We’re running this A3 for six months and will see how it stacks up compared with the similarly priced all-wheel drive, automatic diesel model and the range-topping petrol S3 sporty offering. 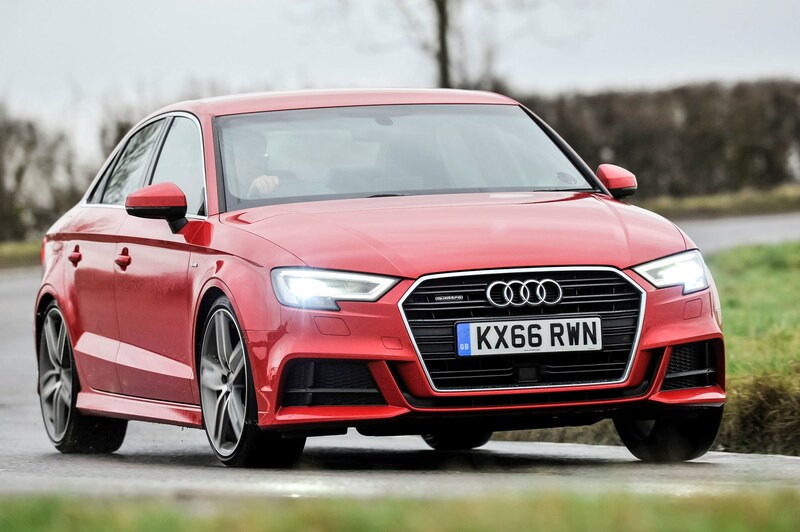 Weighing in at more than the price of a standard S3 Saloon – which offers a huge amount of extra power and added visual muscle – once you count the options fitted, our test A3 better be good. It’s also got stiff competition from the diesel, which is very nearly as fast while offering the prospect of almost 20% greater claimed fuel economy. And when it comes to value you can save yourself around £5,000 by opting for the turbocharged 1.4-litre in manual, two-wheel drive form with the same kit. With the sun beaming, the car practically glowed in the Audi car park as we pulled in. The special red paintjob may cost £550 but judging on first impressions it’s worth every penny. Meanwhile, the 19-inch wheels may be a wallet-busting £1,150 and necessitate spending an additional £995 on Audi Magnetic Ride suspension – presumably to prevent the hefty amount of metal and tiny smear of rubber between car and road causing too punishing a ride – but they do look damn good. The sat-nav also made a good first impression with a slick rotary controller for entering postcodes proving easy to use and much less distracting than the touchscreen systems fitted to an increasing number of cars. Being able to trace out letters with your fingertip on top of it is novel, too, and can be a speedy way to enter details when parked up. Looking around the cabin, apart from the sat-nav that plays hide and seek in the dash at the press of a button and electric front seat adjustment, there’s not much to give away the fact that our car costs more than £37,000. KX66 RWN had just 62 miles on the clock as we grabbed the keys, so we had a look in the manual to see how Audi recommended running it in. The handbook recommended gentle driving, not using full throttle or going above engine speeds of 4,000rpm for the first 625 miles, prescribing steadily working up to using the engine’s full power from here until 930 miles. Heeding the advice, we dawdled out of the Milton Keynes depot where we took ownership. Unsurprisingly, the large wheels made their presence known with a firm ride. What surprised us more was how punchy the engine is at low speeds, with the S tronic automatic gearbox shuffling cogs imperceptibly. Suffice it to say, we’re impressed with how sharp our new long-termer looks and how slick the gearbox and petrol engine combo are so far. We wait to see how comfortable it proves on longer trips and how thirsty it is.